Have you been wondering how to transition into being a full-time Real Estate Agent? Well, I’m going to tell you EXACTLY how to do it. Everything I’m going to reveal to you is directly from my experience making the same transition seven years ago. I wanted to be a full-time Real Estate Agent, but it was unreasonable to quit my day job. Sadly, I thought I had to put my dream on hold until I realized there was another way. So many women quit their jobs and jump head first into the real estate field. Sadly, most of these women struggle to make it, because it can take a little while to close their first real estate deal. They make the mistake of thinking the money is going to start rolling in as soon as they go full time. I’ve seen this happen so many times, and I totally understand why people continuously fall into this trap. Logically, quitting your day job would give you more time to dedicate to real estate, right? You create your own schedule in real estate, but most of your client appointments will be in the evening or on weekends. Most of your clients will also be working 9 to 5 pm. You can’t meet with most clients during the daytime hours, therefore, quitting your day job actually doesn’t help much. The right time to quit your day job and go full time is after you establish yourself as a Real Estate Agent, part-time. I wish I could tell you being a part-time Real Estate Agent was an original part of my plan, but that’s not the real story. Actually, I wanted to go full time as soon as I was licensed, but I was forced to start out part-time. I wasn’t in a position to quit my job because I had bills to pay. I kept my day job for three years while going through the “growing pains” of building my business as a part-time Real Estate Agent. The everyday grind of hustling home after work and paying my dues as a Real Estate Agent in the evening was very hard, but I kept my eyes on the prize. I knew becoming a Real Estate Agent was eventually going to be my ticket to freedom, so I was motivated to put in the extra work. As time passed, my real estate business grew, and my part-time real estate commissions eventually exceeded my full-time income. I knew it was time to safely quit my day job when my part-time real estate commissions doubled my full-time salary. I’ve been in your position, and I’m not smarter than you. If I did it, anyone can do it! I also know that you’re looking for a proven roadmap to get you started as a Real Estate Agent right now; while keeping your current job. Having a day job while being a part-time Real Estate Agent is not easy, but it is the best way to transition into real estate. At first, I didn’t think I would have room in my life to be a part-time Real Estate Agent. I thought I would lose all my free time, but I slowly realized that I was mistaken. Yes, I had to cut out a couple things from my schedule, but I still had time to spend with loved ones and catch up on my favorite TV shows. The transition wasn’t easy, but it was worth it. As I look back now, I cringe as I think of what my life would be like if I didn’t do the hard work. I wouldn’t have the freedom and flexibility that I have today. I’ve seen so many women who fail because they don’t want to do the hard work. Eventually quit your day job (If you choose to)! What Are the Details of this Course? 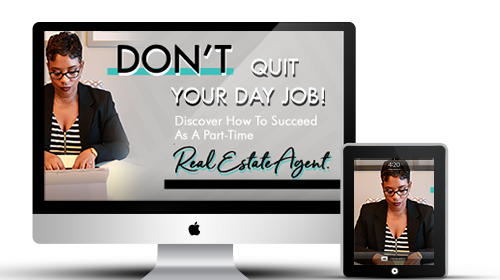 Don’t Quit Your Day Job is an online course that walks you through a ten step action plan designed to give you a proven blueprint to becoming a successful part-time Real Estate Agent. Inside the course, I’ll guide you through ten steps that you can implement right away to jump start your real estate career and build your business before you quit your day job. Then, when the time is right, you’ll be able to make the transition to full-time Real Estate Agent knowing you already have experience selling homes, happy past clients that can recommend you to others, and a solid reputation in your community. Most important of all, Don’t Quit Your Day Job will give you the confidence to pursue your dream of becoming a real estate agent without walking away from your full time job. The action plan will bring you confidence, peace, and liberation. When you start part-time, the income you make from real estate is extra income! Imagine what it will be like to generate extra income to pay off debt, save for tuition, plan vacations, home improvements, give more to charity, and build up your savings. How would that improve your overall quality of life? I started my business without compromising the income I was making from my full time job. I’m an encourager by nature, and I’m highly invested in your success. You can reach out to me anytime in the comments section of the members area. The messages go directly to my inbox, and I usually respond within 24 hours. Everything I learned during my transition to become a part-time Real Estate Agent is in this course. I learned the hard way and you get to benefit from all my mistakes and big wins. I’m 100% certain that this course is the exact “game plan” you need to activate your faith and actions to get started with building your new business. I will show you how to use your current job as a springboard to help you launch and grow your new career. I’m so sure that I want to make you a special promise. Yes, that means if you can take the entire course and get a full refund at the end if you don’t find it helpful. That’s how much I believe in this game plan. The course is yours, risk free. The doubts and pressure can be unbearable sometimes. You’re constantly thinking, “Should I move forward?” or “Is this really for me?” Taking action was the only way I was able to overcome the doubts. As the saying goes, more is learned through movement than meditation. The reason why you aren’t sure if you should pursue this dream is that you’re worried about whether or not you can be successful. If I could guarantee your success beyond a shadow of a doubt, it would be easy for you to take the leap. The truth is, I can’t guarantee your success. The one thing I can guarantee is that hope deferred makes the heart sick. The longer we wait to take action on our dreams, the harder it gets. There’s no better time than today. Get the game plan that will help you achieve your dream of becoming a Real Estate Agent without quitting your day job. PS: Still having some doubts? I can’t promise you that this will work out for you, but I can promise you that I will do everything in my power to help you succeed. The course will give you the game plan, and I will be right there to support you as you chase your dream. I’m not asking you to take a risk on this course. I’m asking you to take a risk on yourself. You’re well worth the risk! Working Girls Are Welcomed Here! Don't Quit PowerPoint (Just an FYI)!